Dracula 2000 (also known internationally as Dracula 2001) is a 2000 American vampire horror film co-written and directed by Patrick Lussier and produced by Joel Soisson and Wes Craven, and starring Gerard Butler, Christopher Plummer, Jonny Lee Miller, Justine Waddell, Omar Epps, Colleen Fitzpatrick, and Jennifer Esposito. The plot follows Dracula, who arrives in New Orleans, Louisiana in the 21st century and seeks out Mary Heller, a descendant of Abraham Van Helsing. Dracula 2000, the promotional title of which is Wes Craven Presents: Dracula 2000, builds upon Bram Stoker's original 1897 novel Dracula, with Count Dracula resurrected in contemporary America. The film was a critical and commercial disappointment, though two direct-to-video sequels, both written and directed by Lussier, were produced. Matthew Van Helsing, the alleged descendant of the famed 19th century Dutch physician Abraham Van Helsing, owns an antique shop built over the site of Carfax Abbey in London in 2000. One night, with Van Helsing upstairs, his secretary, Solina, allows a group of thieves, led by her boyfriend, Marcus, into the shop. The thieves infiltrate the shop's underground high-security vault and find a sealed silver coffin protected by a deadly defense system. Based on the level of security surrounding the coffin, Solina and Marcus decide that the coffin's contents must be valuable, so they escape with it and flee to New Orleans. When Van Helsing discovers that the coffin has been stolen, he boards a plane to America, telling his apprentice, Simon Sheppard, to remain in London. Simon does not follow these instructions and follows his mentor. Aboard the plane, one of the thieves manages to open the coffin, revealing the dormant body of Count Dracula. Dracula awakens and attacks the thieves, causing the plane to crash in the Louisiana swamps. Dracula survives the crash and travels to New Orleans, where college students Mary Heller and Lucy Westerman are living. Mary is estranged from her family and has recently been plagued by nightmares of a strange, terrifying man. Van Helsing and Simon arrive in New Orleans and destroy the newly turned vampires left in Dracula's wake. Afterwards, Van Helsing reveals to Simon that he is in fact the original Abraham Van Helsing, who defeated Dracula in 1897. Because he was unable to destroy Dracula permanently, Van Helsing hid the body and prolonged his own life with regular injections of Dracula's blood filtered via leeches until, one day, he could discover a way to kill Dracula for good. Simon is intrigued by Dracula's hatred of all things Christian and wonders why he is also particularly vulnerable to silver. Van Helsing also tells Simon about his daughter, Mary, who was taken from England by her mother after the truth about his identity came to light. Since Mary was conceived after Van Helsing began his injections, she shares blood and a telepathic link with Dracula, who senses her existence and is in New Orleans to find her. Van Helsing and Simon try to reach Mary before Dracula does, but fail to do so before Dracula turns Lucy into a vampire. Dracula and his three new brides, Solina, Lucy, and Valerie (a news reporter bitten after the plane crash), corner Van Helsing and kill him. Simon and Mary escape, only to be captured by Dracula shortly thereafter. On a rooftop, Dracula transforms Mary and in the process reveals his secret: he is none other than the Apostle Judas Iscariot, who betrayed Jesus for a bribe of thirty pieces of silver. As he went to hang himself, the rope snapped and as punishment he was cursed to live for two thousand years as a vampire. The three brides appear with Simon, and Dracula tells Mary to bite him. However, Mary takes the opportunity to save Simon's life by faking the bite instead. Then, together Mary and Simon kill the three brides. Angered by this, Dracula tries to throw her from the rooftop. Mary wraps some cable from a large crucifix around Dracula's neck and they both fall from the roof. Dracula hangs as he attempted to do two thousand years before, but this time the rope does not break, and he burns in the first sunlight. Mary survives the fall and is cured of her vampirism by Dracula saying "I release you" before he dies. In the end, she is doubting of whether the sun has truly killed Dracula. She returns him to the vault beneath Carfax Abbey and vows to watch over his ashes should he ever rise again. Her vampirism isn't completely cured as her eyes briefly turned red again. The initial draft was penned by producer Joel Soisson. After Harvey Weinstein purchased the screenplay, he called script doctor Scott Derrickson to tell him he had purchased the script solely on the basis of its title and thought that it "sucked." Derrickson, along with Ehren Kruger and Paul Harris Boardman, heavily rewrote the screenplay, though none are credited in the final film. Dracula 2000 opened at #7 in its first week at the box office with $8,636,567. In its second week, the film had a 56.5% drop-off, but hung onto the #8 spot. The film grossed $33,022,767 domestically and $14,030,858 overseas for a worldwide total of $47,053,625, failing to make back its $54 million budget. On its initial video release, it grossed an additional $32 million in the US and Canada and continues to make money worldwide. Dracula 2000 was the sixth-highest-grossing film for Miramax/Dimension Films in 2000, exceeding the box office takes of such expensive Dimension Films releases like Reindeer Games and Impostor, as well as Miramax's December opener for that year, All the Pretty Horses. The film received generally negative reviews from critics. Rotten Tomatoes reports a rating of 17% based on 66 reviews, with an average rating of 3.6/10. The site's consensus states: "This retelling tries to offer a different spin on the origin of Dracula. Unfortunately, there's nothing here audiences haven't seen before." On Metacritic, the film has a 26 out of 100 rating, based on 14 critics, indicating "generally unfavorable reviews". Berge Garabedian of JoBlo offered a positive review, calling it "A fun vampire movie", "a novel adaptation of an old time legend", and "[good] for pretty much anyone looking for some enjoyable bloody fun." 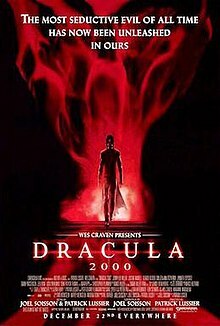 BeyondHollywood.com wrote, "Dracula 2000 is not the worst vampire movie I've seen, but it's definitely not the best either. There are some very good moments, most of them featuring the frail Van Helsing as he attempts to battle the fast and deadly vampires. Also, I appreciated the background given to Dracula's aversion to silver, crosses, and God, as well as Dracula's 'true' origins. Not bad work, but it could have been much better." Owen Gleiberman of Entertainment Weekly gave the film a "C-" score, while James Berardinelli of ReelViews panned the film, writing: "Of all the indignities to have been visited upon Dracula during the past century (including being the "inspiration" for a cereal and a Sesame Street character, and being lampooned by Mel Brooks), none is more unsettling than what has happened to the world's most famous vampire in Dracula 2000." The film's rock and metal soundtrack includes Powerman 5000's song "Ultra Mega", Linkin Park's song "One Step Closer", Pantera's song "Avoid the Light", System of a Down's cover of Berlin's "The Metro", Slayer's song "Bloodline" and Disturbed's song "A Welcome Burden". The original score composed by Marco Beltrami was released in 2017 by Varèse Sarabande as part of the label's Little Box Of Horrors limited edition 12-disc set. Dracula 2000 was followed by two direct-to-video sequels, Ascension in 2003 and Legacy in 2005. Lussier and Joel Soisson, who directed and wrote all three films, created a plot for a fourth film and discussed releasing it theatrically, but no film has yet been produced. ^ a b "This week in Hollywood". EW.com. June 16, 2000. Retrieved January 3, 2017. ^ a b "The Devil Is Real. Therefore". Books and Culture. Archived from the original on January 4, 2017. Retrieved January 3, 2017. ^ "DRACULA 2001 (15)". British Board of Film Classification. March 22, 2001. Archived from the original on March 5, 2016. Retrieved October 22, 2015. ^ a b c d "Box Office". Archived from the original on March 2, 2012. ^ "vampyreverse, the". Archived from the original on September 23, 2016. ^ "Patheos, Interview; Derrickson, Scott". Archived from the original on December 22, 2016. ^ "Dracula 2000 Movie Reviews, Pictures". Rotten Tomatoes. Archived from the original on March 27, 2009. Retrieved July 8, 2009. ^ "Wes Craven Presents: Dracula 2000 (2000): Reviews". Metacritic. Archived from the original on September 4, 2010. Retrieved July 9, 2009. ^ "Dracula 2000 (2000) Movie Review - BeyondHollywood.com - Movie News, Reviews, and Opinions". beyondhollywood.com. Archived from the original on May 3, 2009. ^ Wes Craven Presents: Dracula 2000 | Movie Review Archived July 3, 2009, at the Wayback Machine Owen Gleiberman, Entertainment Weekly, 3 January 2001. ^ Berardinelli, James. Dracula 2000 review, ReelViews, 2000. ^ BD Horror News - Patrick Lussier Talks Fourth 'Dracula' Film Archived September 30, 2012, at the Wayback Machine, BloodyDisgusting.com, 10 June 2009.